Decades of research have made it clear that formative instructional practices (FIP) are the heart of effective teaching and learning. Every district, school, and classroom is different—your implementation plan will be unique to the context of your school, but these implementation tools can provide a framework that leads you to success. Note: Ohio Portal login is required to access this resource. 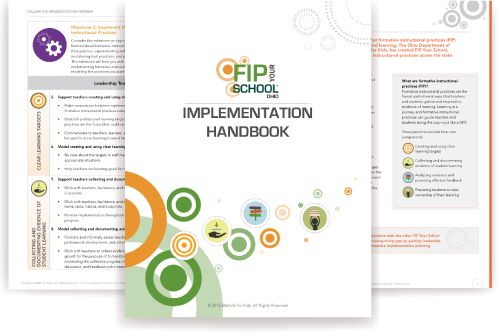 The FIP Your School Implementation Handbook is designed to help school leadership teams successfully plan for and implement formative instructional practices. Section 1: Guidance on identifying your team and how to get familiar with the FIP Your School tools. Section 2: Strategies for setting the right conditions and following the implementation pathway milestones. Section 3: Tools to document your plan and collect evidence about your implementation. Section 4: Teacher and leadership self-assessments and student survey tools to encourage effective feedback and reflection about practice. Section 5: An inventory of FIP Your School tools, references to other resources, and a guide to mapping a plan for blended learning. 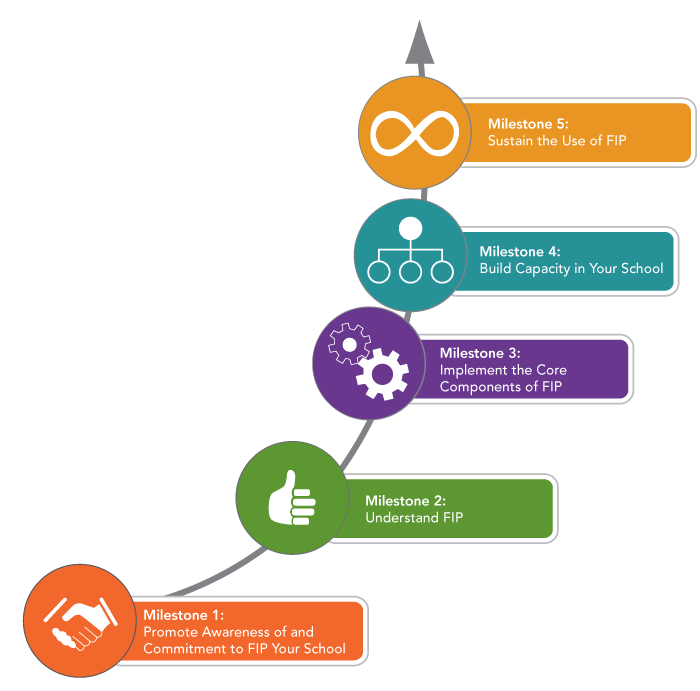 The FIP Your School Implementation Pathway below describes five milestones for implementation, beginning with awareness and leading to the sustainable use of these practices. Using these milestones as a guide, you can design an implementation plan that will allow you to sustain formative instructional practices over time. Explore each milestone by clicking the image below. To advance and support the use of formative instructional practices, start by building awareness and commitment to this effort throughout your school community. Don’t skip this critical milestone—sharing the vision for this work, and communicating clearly and thoughtfully to all stakeholders, will set you up for success. FIP Your School provides a blended learning experience designed to help all teachers explore and understand the core components of formative instructional practices. In this milestone, you can create a plan for blended learning that takes advantage of the resources available through FIP Your School and sets your school up for a successful implementation. Consider this milestone an opportunity for teachers to apply what they’ve learned about formative instructional practices by setting goals for their own practice, experimenting with new techniques and strategies, collaborating and sharing ideas, and providing each other with feedback. The ultimate goal is to spread the use of FIP across all staff members and continually deepen skill and expertise over time. This milestone is a reminder to think about how you will build capacity in a systemic way, moving toward sustainability. Formative instructional practices are not a project or initiative; they are the heart of the teaching and learning process. To sustain the use of formative instructional practices, consider ways that these practices can be embedded in the daily routines, structures, and expectations that create your school culture.